Description - This bird is the smallest and most common of the falcons. The back and tail are rusty coloured; the adult male has slate blue wings, the female's are rusty and she has bands on her tail. Both sexes have two black stripes on the face. The call is a sharp "killy-killy-killy". Distribution - The American kestrel breeds from Alaska and the North West Territories east through Canada and south throughout the continent. Wintering grounds are throughout the U.S.A. north to B.C. They prefer farmlands, parks and open country and can be found in towns and cities. 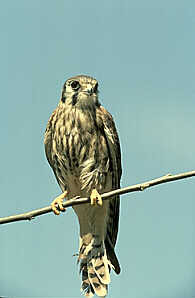 Biology - Referred to as the "sparrow hawk" because it occasionally takes small, sparrow-sized birds as prey. But their diet is mainly insects in warmer climate. In cooler temperatures they will feed on insects, small rodents, small amphibians, reptiles and birds. During the incubation of the eggs and after they hatch, the male brings the food to the female and his young. The American Kestrel places 4 or 5 white or pinkish eggs in a natural or man-made cavity without a lining.